On the dark theme the Search and Menu items are hard to see. Should be better now if you F5. The CSS seemed to auto update as you changed it. 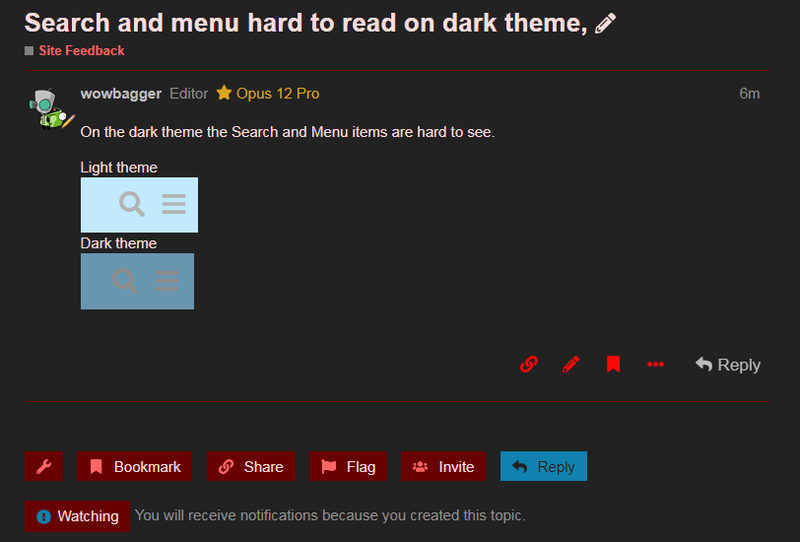 It's difficult since there are only two color settings for the header, and everything else is derived from them, and it seems designed around light themes. On top of that, the Opus logo is black text, so the header can't be too dark or it becomes invisible. Hopefully it looks "OK enough" now. Not sure why, but the logo at the top started looking rather odd to me. Had to block it from loading. Not sure why, but the logo at the top started looking rather odd to me. The logo is black text on a dark background. I'm not sure if we can have separate logos for each theme, but it doesn't seem that important since you know where you are by the time you've changed themes.